Passover is the festival of freedom. For weeks we prepare to reacquire our freedom, to reaffirm our freedom and to celebrate our freedom, by cleaning our homes and our persons of all manners of chametz – leavened food stuffs, and even food stuffs that could potentially become leavened. We do this to the very last speck of chametz, removing it completely from our lives for seven whole days. Leaven causes things to rise, to take up space, to become full of themselves. The material chametz that we diligently remove from our homes in preparation for Passover parallels the spiritual chametz that we are equally diligent in removing from our souls and our psyches and egos, as we prepare for Passover. To fully receive freedom and to fully embrace freedom we need to clear ourselves of our own inflated self importance, of the crumbs that fill our lives and distract us from our purpose and our potential. We replace our chametz with matza, an unleavened, unassuming bread that doesn’t bedazzle or bedevil us with idle distractions, the bread of our fathers before they went down to Egypt, before they became bondsmen. When they were free. Passover is the festival of freedom. In Temple times we take for ourselves a lamb, not yet a yearling, unblemished, and accompany it to the Holy Temple courtyard, where it is slaughtered, and eat of it, each one of us, a single morsel, so that all can partake, until all the meat is consumed, and finish it before midnight, as our ancestors did in Egypt, reclining and eating in ease, until it was midnight, the appointed time to leave our slavery behind and leave Egypt forever. The Korban Pesach – Passover Offering – is a bond, a brit, an eternal covenant between ourselves and G-d, a two-party contract, a guarantor of our freedom. Without a commitment to G-d there is no freedom. Christians also have deleveaned as well (see Should Christians Keep the Days of Unleavened Bread?). Passover Offering Reenactment At Foot Of Temple Mount Draws Ire Of Palestinian Authority: Palestinians across East Jerusalem will hold mass protests on Friday in the wake of a court-approved Passover sacrifice ceremony held by religious Jews close to the Temple Mount on Monday, the leader of the city’s Al-Aqsa Mosque announced. The Jerusalem District Court gave the go-ahead for the Bible-mandated ritual of slaughtering the paschal lamb not on the Temple Mount, the holiest site for Jews, but just below it, in the Davidson complex. Click here to learn more and view a video. Israeli forces have killed at least seven Palestinians as thousands protest for their return to what is now Israeli territory. 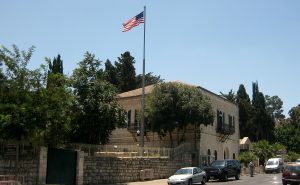 The protests will continue until the inauguration of the new US Embassy in Jerusalem. Thousands of Palestinians, including women and children, marched along the Gaza-Israel border on Friday, in a protest that has left at least seven Palestinians dead and more than 500 injured after clashes with Israeli forces. The death toll includes one man who was killed overnight by Israeli tank fire after the military responded to two suspects who had approached the border fence in the southern Gaza Strip. The protest, which has the backing of Hamas, is expected to last more than six weeks, as US President Donald Trump’s decision to recognize Jerusalem as Israel’s capital comes to fruition. “The Great March of Return is a message to Trump,” German news agency DPA reported Ismail Haniyeh, the chief of the Hamas political bureau, as saying in a speech to thousands of protesters on Friday. Whether or not Donald Trump will particularly care can be debated–but so far, he has not indicated any desire to change his decision to recognize Jerusalem as Israel’s capital by ordering the moving of the US Embassy there. As far as Gaza goes, those in Gaza WILL end up with more territory and the tiny State of Israel will LOSE territory it now controls according to biblical prophecies (for details, see Gaza and the Palestinians in Bible Prophecy). Expect more tensions in the Middle East. Should Christians Keep the Days of Unleavened Bread? Do they have any use or meaning now? What is leaven? This article supplies some biblical answers. Here are two YouTube videos intended to be viewed for the first day of unleavened bread: Leaven and Sin and Christians and the Days of Unleavened Bread. This entry was posted on Friday, March 30th, 2018 at 7:00 am	and is filed under Religious News. BIN: Will Israeli Elections Bring Back the Real Passover Sacrifice?